A specially selected assorted collection of 100 squeaky toys. 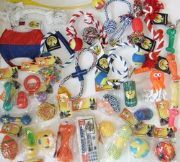 320 Quality Mixed Toys, perfect money saver!!! Tie Out Stake used for attaching to a dogs leash.